1. Indicate search criteria when searching for an event. 2. Select a specific event. 3. Select seats in the digital seating chart. 4. LogIn (please consider the information in the LogIn area). 5. Pay by credit card. 6. Tickets are printed out or, alternatively, made ready to be picked up or sent to you. In order to print out the tickets, you will need the latest version of the Acrobat Reader so that the barcode can be clearly recognised on the ticket. You can download the current version of the Acrobat Reader free of charge here . With the shopping cart function, you can place as many orders as desired, one after the other, and then collect them in your shopping cart. Only at the end do you pay in one step. Please do not use the “Zurück” (back) button whilst booking, or else your booking procedure will be interrupted! We accept VISA, MASTERCARD, AMEX and JCB for payment. If your information is clear and complete, you can have the tickets printed out or sent to you (sending tickets up to 10 days within Germany and up to 20 days prior to the event). If sending is not possible, your tickets will be left at the box office ready to be picked up until the beginning of the event. You will receive a confirmation of your booking procedure by e-mail at the e-mail address that you have indicated. Due to the credential that must be presented, it is not possible to obtain or reserve reduced-price tickets online or by telephone. For reduced-price tickets, please contact the Box Office, Bismarckstrasse 35, 10627 Berlin starting one week prior to the desired performance. We wish to point out that the view of the stage can be restricted, depending on the staging. We also request that you regard the surtitles as a service which cannot be of equal benefit to all spectators, since it is dependant on the location of the seat. A service charge of € 2,– per ticket will be charged for seat reservations made by phone, in writing or online. Tickets will be mailed on request. The service charge is waived for subscribers and Friends. Monday to Saturday 11 am to start of performance. On days without performances the box office is open until 7 pm; closed on Sundays and Holidays. Season ticket holders and Förderkreis members have priority and can buy season tickets and individual tickets from the beginning of February onwards. Advance Tickets Sales for 2018 / 2019 season open on 17 April 2018. From the beginning of regular advance ticketing onwards you can purchase tickets by telephone, in writing or direct from the box office of the Deutsche Oper Berlin, Bismarckstraße 35, 10627 Berlin. 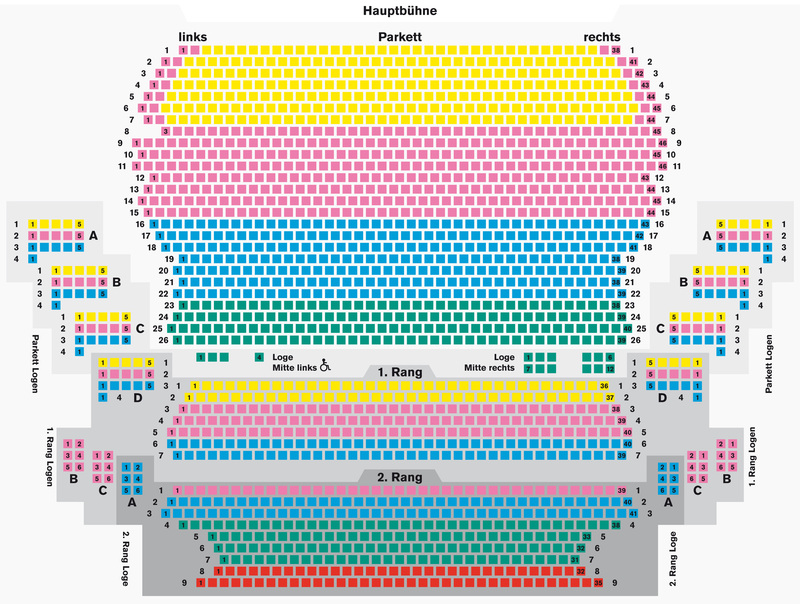 When ordering tickets on our website www.deutscheoperberlin.de you can use the auditorium plan to specify your seat location. Please allow us to point out that spectators’ view of the stage can possibly be obstructed depending on the production. In addition, please regard the supertitles as a service from which not all seats can profit to the same extent. The prices of individual tickets are indicated. A service fee of € 2,– per ticket will be charged for reserved or booked tickets. The cloakroom fee is included in the ticket prices. Proof of status is required when purchasing reduced-rate tickets and at the door. Reduced-rate tickets are not transferable. Due to the proof-of-status requirement, reduced-rate tickets cannot be purchased or booked online or by phone [except for family and children’s performances]. Holders of B-grade Severely Disabled ID cards are entitled to a free ticket (in any price category) for a companion. Students, trainees, pensioners, retirees and the unemployed are entitled to a 25%* discount on any available tickets. This discount also applies to performances with general admission and to foyer events. School children [20 years old or less] and Germans doing voluntary military or social service are entitled to a 50%* discount. Children and teenagers, school children [20 years old or less], students and trainees, the unemployed and Germans doing voluntary military or social service can purchase a limited number of tickets for €15.00*, subject to availability; ALG II and state-benefit recipients pay €3.00*. *) Discounts do not apply to the following events: premieres, external performances, specially priced events and performances by the Staatsballett Berlin. The discounts are subject to ticket availability and are offered at the discretion of the Deutsche Oper Berlin, which allocates seating and cannot consider individual seating requests. € 10,– Tickets to family performances [incl. advance sales] for children and teenagers under 18 years of age. Prior to the start of the 2018/2019 season subscribers will be sent their personal AboCard (Subscribers Card ) to be presented when claiming the 2018/2019 subscriber discount. After purchasing tickets for more than nine different performances, you can obtain the TreueCard (Loyalty Card) upon request, free of charge. (Offer is valid for one ticket per performance. Subscription tickets included.) Starting with the 10th performance, the TreueCard gives a 30% discount on tickets of Price Categories A, B & C and 10% off Category D & E tickets. Exceptions are external productions, specially-priced performances, external productions, performances of the Berlin State Ballet and events aimed at children or with unitary ticket prices. Please note that the TreueCard can be used only by the holder and is non-transferable. To apply, please submit the corresponding admission tickets and a passport photo (if the TreueCard is being issued for the first time). For the nonrecurring flat price of € 15,–, young people aged 29 or under can choose from over 1500 top concerts, operatic and ballet performances. The ClassicCard, valid for an unlimited number of performances over a period of 12 months, allows holders to experience their favourite works from the best seats – all at the special price of € 8,– for concerts and € 10,– for opera and ballet. These preferential terms are valid at respective box offices and on the respective evening for events of the Deutsche Oper Berlin, Komische Oper Berlin, Konzerthaus Berlin, Radio Orchestra and Choirs [ROC] of the Deutsches Symphonie-Orchester Berlin, Berlin Radio Symphony Orchestra, RIAS Chamber Choir and the Berlin Radio Choir, as well as the State Opera at the Schiller Theater and the Berlin State Ballet. ClassicCards are available at the box offices of the participating institutions as well as at Dussmann – Das KulturKaufhaus. For comprehensive information, visit www.classiccard.de. Purchased entry tickets may not be resold for commercial purposes without the prior consent of the Berlin Opera Foundation. If contravened, the Berlin Opera Foundation reserves the right to legal recourse. Furthermore, the Foundation is entitled to refuse to sell entry tickets in future to those contravening the aforementioned prohibition. Objects and clothing carried by the guest, in particular backpacks, suitcases or larger bags have to be deposited at the cloakroom during the performance. Animals will categorically not be supervised. The Berlin Opera Foundation reserves the right to charge a cloakroom fee. The personal order data can be collected, processed and used for the purpose of customer care by the Berlin Opera Foundation (Deutsche Oper Berlin, Staatsoper Unter den Linden, Komische Oper Berlin und Staatsballett Berlin) if the visitor has given his consent during the purchase process. Customer care is defined as taking measures intended to supply the customer with significant information and thus further provide the customer with specific benefits. The customer was informed that he can at any time revoke this agreement without prejudice. Berlin Opera Foundation affirmed that data privacy is absolutely ensured and that the data will not be transmitted to third parties. These General Terms and Conditions will come into force on 1st September 2017. At the same time, the General Terms and Conditions of the Berlin Opera Foundation valid up to that point will expire. Should any stipulation of these General Terms and Conditions be invalid, the legal validity of the remaining Terms and Conditions will remain unaffected. The Berlin Opera Foundation is neither prepared nor obliged to take part in dispute settlement procedures by any consumer dispute settlement authority. This English translation of the General Terms & Conditions is a service of the Berlin Opera Foundation. Thus the current German version is solely legally binding.